*LLND is an international media artist duo merging sound, image and matter in an approach combining physical reality, science, myth, technology, and real time. Since they met in 2003, they developed multiple participatory, Innovative concepts in creating audio and visual instruments and Art Installations. Their works have been featured in many international Art events. *LLND, initials of Laurent Lettrée and Nathalie Delpech , based in Shanghai , China since 2009. Nathalie is a graduate of ENSAD Arts Decoratifs in Paris cinema section, video, animation with a degree in special effects and postproduction. Her video and graphic art are often perceived as a poetic meeting of the psychedelic and surrealism. With strong colours and forms borrowed from a revisited reality, she gives life to the inanimate objects. Laurent is composer and self-taught electronic machinery builder, he explores the sound and its multiple frequencies and rhythmic variations. Since 1994 , *LL makes Electronic music and started programing with Max MSP in 2003. He lived and performed during 7 years in the United States. *LLND est un duo d’artistes inter media qui fusionnent le son, l’image et la matière dans une approche mêlant réalité physique, technologie, science, et temps réel. Depuis leur rencontre en 2003, ils ont développe de multiples concepts participatifs, innoves dans la création d’instruments sonores et visuels. Leurs œuvres ont été présente internationalement dans de nombreux évènements artistiques. *LLND, initiales de Laurent Lettree et Nathalie Delpech sont bases en Chine depuis 4 ans. Nathalie, diplomee des arts decoratifs de Paris section cinema, video, animation avec un post diplome en effet speciaux et Laurent, compositeur et constructeur de son, autodidact a vecu et performe durant 7ans au Etats Unis. 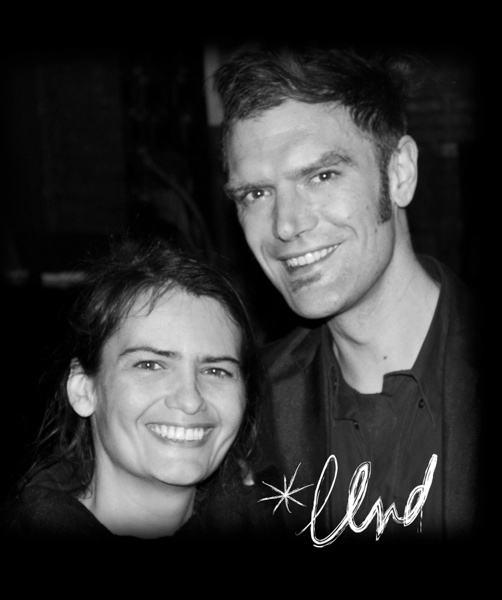 We met in October 2003 at La Miroiterie (famous Parisian Artist squat) and soon after started the duo *LLND. Now, we live and work in Shanghai since 2009 and you can often see us perform audio visuals or exhibit at various Art venues. For the Crossed Years France-China 2004, we traveled to Beijing to produce 4 short films and a participative installation. During this trip we met with Feng Jiang Zhou, Yan Jun and FM3 at 798 Art zone. The artists were soon reunited in September 2004 at the first Shanghai biennial where we shared the Opening performance stage with B6 and others now famous Chinese artists. We started the Time Compressions that year, pushed by the need to retrieve and share our memories of our first trip to China. we presented our first solo exhibition titled Kit Art at the Anne Lettree Gallery in Paris. 2006 marked our return to China for a Digital Art exhibition at the Cartoon Festival of Changshou organised by Xiaoying Yuan. In June 2008, we are selected by the National Museum in Beijing during the Olympics. Continuously attracted by China, our Art family left in 2009 to Chongqing at Organhaus Art Residency during 3 months to create The Silk Road The Inner Road (audio visual performance). After this amazing experience, Jin JiangBo offered us a space inside Creative Star, his 10 000sqm warehouse in Shanghai to continue working on an 18 Connected Brains sculptures installation; this is where we met KingHood who was intrigued by our media Art way of doing things. Thanks to KingHood, we participated to the first and second Xucun international residency project in Shaanxi mountains, a 1000 years old village saved by the Arts biennial. We made friends there with Shen Xiaomin (world famous conceptual Artist) and many others as well as the curator Mil Wang. In 2010, we organized for the French Music National Day, the Electronic Worlds music tour festival with Chinese and French Artists (Li Daiguo , Claude Yvans, Dickson Dee , Yan Jun, Mei Lin, B6, Audioflow , LON). In 2014, we exhibited Time Resonance at La Maison Chopard, curated by Victoire Veller. 2015 at Noeli Gallery was Gravity, at Ningbo Museum of Art, Resonance of the Breaths, at Lumiere China, Heart Beat Harmony.